Even though AutoTweet makes it very easy to publish social posts from your Joomla!™ site, by default on Page Load mode (with the System-Automator Plugin), it still requires visiting the site's frontend to process Requests and Posts; or it requires you to log, click on the Publish button to complete the publishing operation. In addition, there is no way to be 100% sure of the publishing time. Our job is to automate your life, making repeated and time-consuming procedures a breeze. To this end, we offer different publishing automation possibilities for AutoTweet. These features are available only in AutoTweetNG PRO and Joocial. 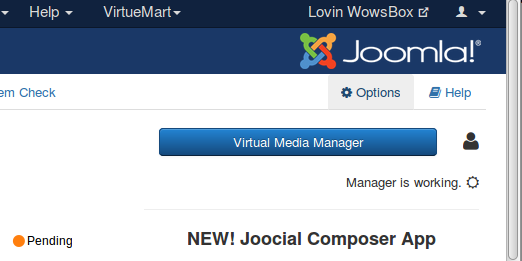 For AutoTweetNG or Joocial to run smoothly, you will need to set up a CRON job to run periodically. By unloading this processing task to a scheduled job, the extension will be able to run faster and in a predictable way. Deliver posts to social networks, especially when you publish to many channels or/and high volume of posts. Detect new inserted articles in the database. The front-end processing feature is intended to provide the capability to perform an unattended, scheduled social publishing from your site or feeds import with the articles grabber. Do you want to automate your publishing despite your host not supporting CRON? Webcron.org fully supports AutoTweet's front-end publishing feature and is dirt cheap - you need to spend about 1 Euro for 1000 publishing runs. Before beginning to use this feature, you must set up AutoTweet to support the front-end publishing option. First, go to AutoTweet's main page and click on the Component Options button. 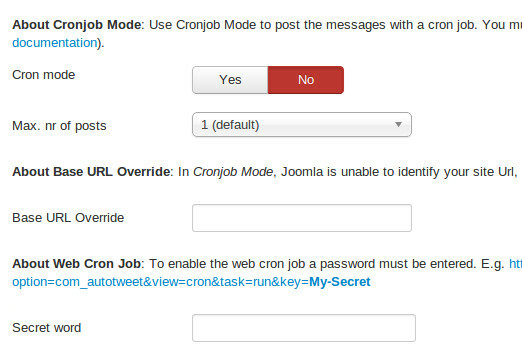 Find the option titled Cron job mode, enable CRON mode and set it to Yes. Below it, you will find the option named Secret word. In that box, you have to enter a password which will allow your CRON job to convince AutoTweet that it has the right to publish from the call. Think of it as the password required to enter the VIP area of a nightclub. After you do it, click the Save button on top to save the settings and close the dialog. About Base URL Override, it refers to your site domain https://www.yoursite.com. For instance, on our main site, Base URL Override is https://www.extly.com . Use only lower- and upper-case alphanumeric characters (0-9, a-z, A-Z) in your secret key. Other characters may need to be manually URL-encoded in the CRON job's command line. This is error-prone and can cause the publishing operation never to start even though you'll be quite sure that you have done everything correctly. If your host only supports entering a URL in its "CRON" feature, this will most likely not work with AutoTweet. There is no workaround. It is a hard limitation imposed by your host. We would like to help you, but we can't. As always, the only barrier to the different ways we can help you is server configuration. Do not forget to surround the URL in double quotes. If you don't, the command will fail and it will be your fault! The reason is that the ampersand is also used to separate multiple commands in a single command line. If you don't use the double quotes at the start and end of the publishing URL, your host will think that you tried to run multiple commands and load your site's homepage instead of the front-end publishing URL. Contact your host; they usually have a nifty help page for all this stuff. Read also the section on CRON jobs below. wget is multi-platform command line utility program which is not included with all operating systems. If your system does not include the wget command, it can be downloaded at this address: https://wget.addictivecode.org/FrequentlyAskedQuestions#download. The wget homepage is here: https://www.gnu.org/software/wget/wget.html. The ampersands above should be written as a single ampersand, not as an HTML entity (&amp;). Failure to do so will result in a 403: Forbidden error message and no publishing will occur. This is not a bug, it is the way wget works. Assuming that you have already bought some credits on webcron.org, here is how to automate your publishing using their service. We strongly recommend using only alphanumeric characters, i.e. 0-9, a-z and A-Z. For the sake of this example, we will assume that you have entered ak33b4s3cRet in that field. We will also assume that your site is accessible through the URL https://www.example.com. Name of Cron job: anything you like, e.g. "AutoTweet www.example.com"
Timeout: 180sec; if the publishing doesn't complete, increase it. Most sites will work with a setting of 180 or 600 here. If you have many channels and feeds which take more than 5 minutes to process, you might consider using AutoTweet native CRON script (autotweetstartcronjob.php) instead, as it is much more cost-effective. Alerts: If you have already set up alert methods in webcron.org's interface, we recommend choosing an alert method here and not checking the "Only on error" so that you always get a notification when the publishing CRON job runs. Now click on Submit and you are all set up! If you are still having trouble with the above options, and your host does not provide any Cron job support, use any free online Cron job scheduler service available on the web. Do not worry about security because what these sites do is merely accessing the Url at a certain interval, which is open to anyone. Finding the correct command to issue for the CRON job is tricky. This recipe applies not only to SiteGround , but many other commercial hosts as well. curl -b /tmp/cookies.txt -c /tmp/cookies.txt -L -v "<url>"
Lynx is a text-based browser that is installed in most hosting environments. If you do not have Lynx installed, you can use other alternatives such as wget, detailed above. Don't worry, this operation runs very fast and has a very little impact on the server, equivalent to a normal single page load. To add a new Cron Job in cPanel 11, log in to your cPanel and click Cronjobs under the Advanced section as the screenshot below. Users report that they get no joy using this script on GoDaddy hosting. If you have access to the command-line version of PHP, AutoTweet PRO or Joocial includes an even better - and faster - way of publishing your messages. All AutoTweet PRO or Joocial releases include the file cli/autotweetstartcronjob.php, which can be run from the command-line PHP interface (PHP CLI). In contrast with previous releases, it doesn't require the front-end publishing to work; it is self-contained, native publishing for your Joomla!™ site, even if your web server is down! Most hosts do not impose a time limit on scripts running from the command-line. If your host does and the limit is less than the required time to publish from your site, the job will fail. This script is not meant to run from a web interface. If your host only provides access to the CGI or FastCGI PHP binaries, autotweetstartcronjob.php will not work with them. The solution to this issue is tied to the time constraint detailed above. Some servers do not fully support this publishing method. The usual symptoms will be a job which starts but is intermittently or consistently aborted in mid-process without any further error messages and no indication of something going wrong. In such a case, trying running the publishing or feeds import from the back-end of your site will work properly. Common Settings, Choose the frequency of your publishing, for example once per day. where myusername is your account's user name (most probably the same you use to login to cPanel). Do note the path for the PHP command line executable: /usr/bin/php5-cli. This is the default location of the correct executable file for cPanel 11 and later. Your host may use a different path to the executable. If the command never runs, ask them. We can't help you with that; only those who have set up the server know the changes they have made to the default setup. Finally, it should be noted that you can use the command-line override feature to do more tricky configuration overrides, for example turning off the archive splitting or using a different publishing output directory to enhance your security. If it is something you can do on the Configuration page of the component, you can also do it using command line overrides. There is an alternative to wget, as long as your PHP installation has the cURL extension installed and enabled. For starters, you need to save the following PHP script as autotweet.php somewhere your host's CRON feature can find it. Please note that this is a command-line script and does not need to be located in your site's root; it should be preferably located in your site's root, in a nonweb-accessible directory. In order to configure it for your server, you only have to change the first three lines. The ampersands above should be written as a single ampersand, not as an HTML entity (&amp;). Failure to do so will result in a 403: Forbidden error message and no publishing will occur. This is not a bug, it is the way wget and PHP work. Where /usr/local/bin/php is the absolute path to your PHP command-line executable and /home/USER/social_publishing/autotweet.php is the absolute path to the script above. 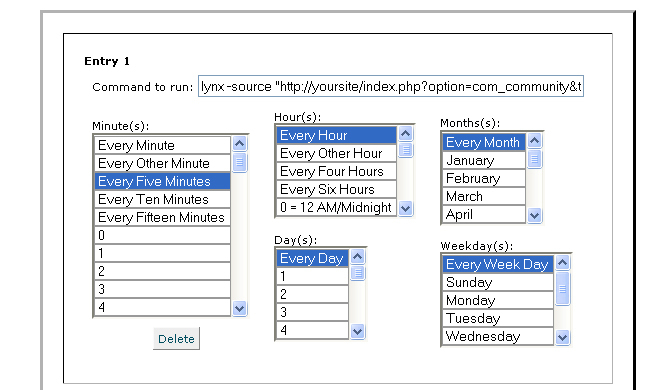 If you set up your CRON schedule with a visual tool (for example, a web interface), the command to execute part is "/usr/local/bin/php /home/USER/social_publishing/autotweet.php".